Handyman Service for Peacehaven and Telscombe,Telscomb Cliffs. and the rest of East Sussex & West Sussex. We provide a Professional reliable handyman service for Domestic and Commercial premises..
We cover all the Towns in East and West Sussex when possible. No jobs are too small. We do not charge extra for traveling time so whether your Home or Business premises are just around the corner in the next street or 30miles away you are still only charged our very low reasonable rates. 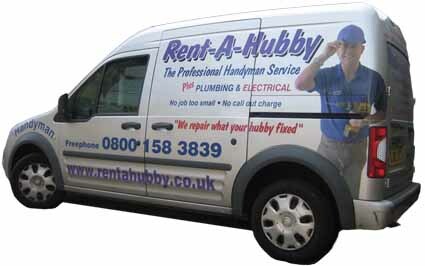 At Rent-A-Hubby We take the time to understand what you really want, and with every project we undertake, you can be assured that you will receive reliable, quality workmanship. Saturdays with an extra charge. We will even collect what ever is needed to finish off the job or project within a five mile radius of your location. Or if you would prefer we can take you to the shop or store to choose and pick up what ever you want, providing its not to large to fit inside our vans.